Taking fruits and vegetables and converting them to pure, preservative free juice can be an exciting transformation to watch. The juice can help you incorporate the health benefits of fruits and vegetables you don’t normally eat, into your diet. Using a masticating juicer requires a little more prep time since the chute is smaller and requires larger foods be cut prior to use, but if you’re a serious juicer, the results are worth the effort. 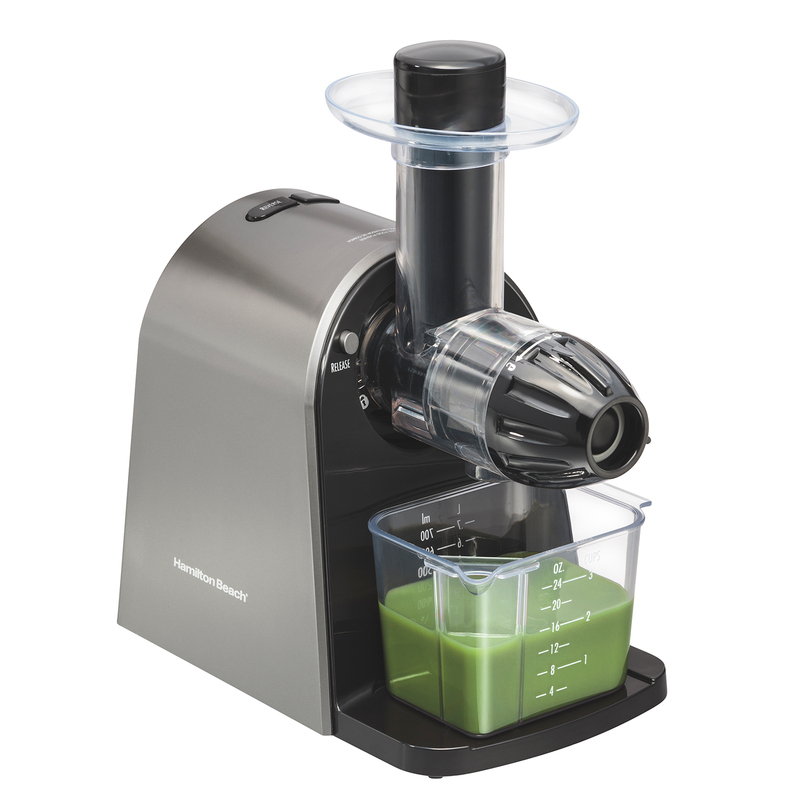 Compared to the leading centrifugal juicer, the slow juicer produces twice as much juice when crushing spinach. And it’s so easy to use there’s no reason not to make juicing part of your healthful lifestyle. Simply guide food gently down the juicer chute. 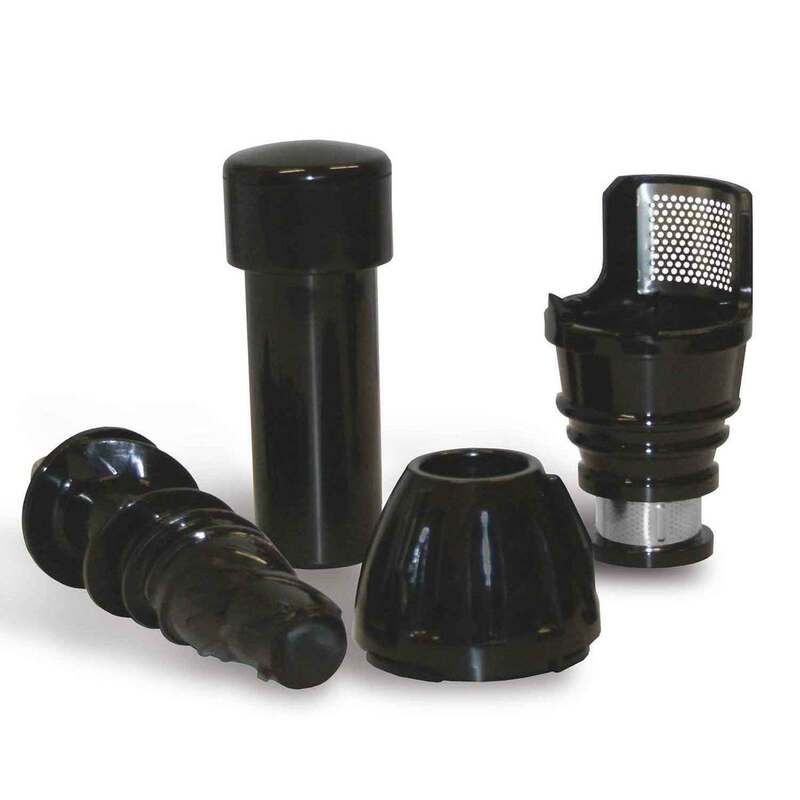 Auger pieces disassemble for easy washing. 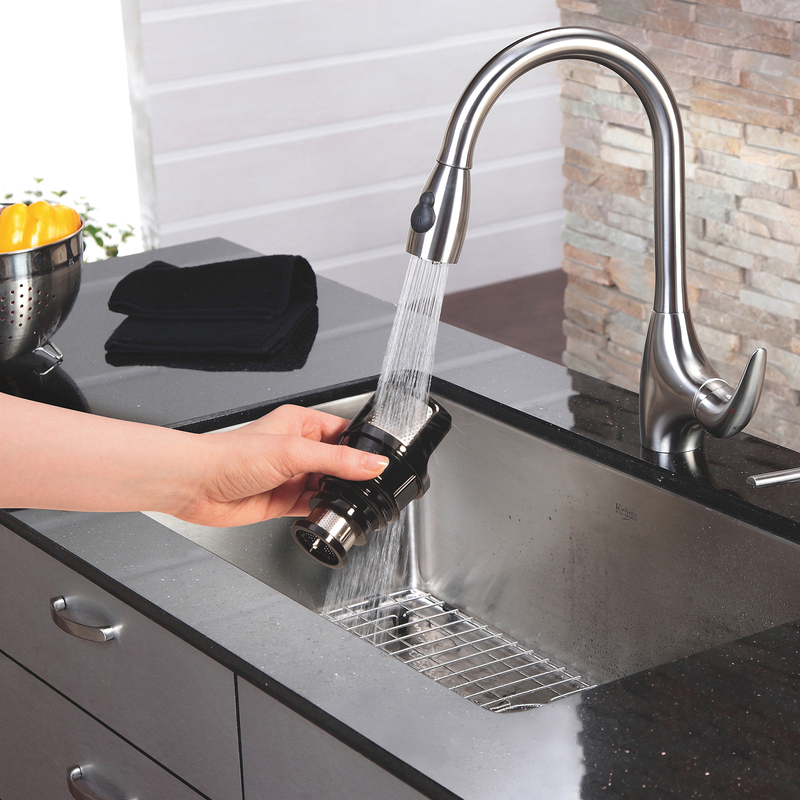 Parts easily rinse clean or can be put in the dishwasher. 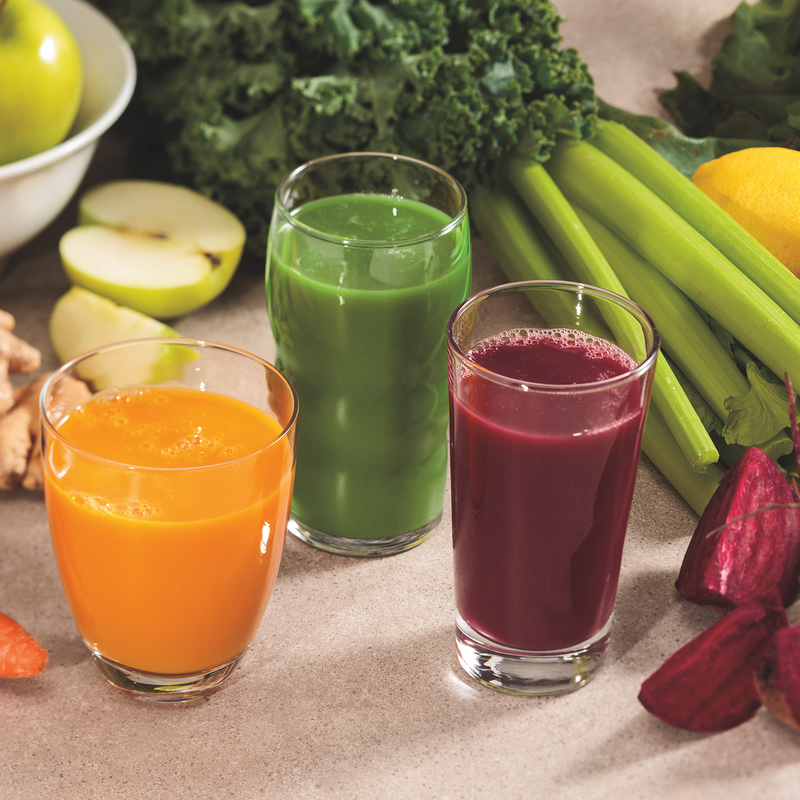 Once you start juicing, you will see the possibilities for flavor packed drinks are endless. We’ve tested many recipes and have found combining fruits and vegetables can give you palate pleasing results and the nutritional boost you need. One suggestion is to take a medium granny smith apple, a large, trimmed beet and a medium peeled lemon and cut them into pieces. Juice them through the extractor in the order listed above, stir, serve and enjoy. 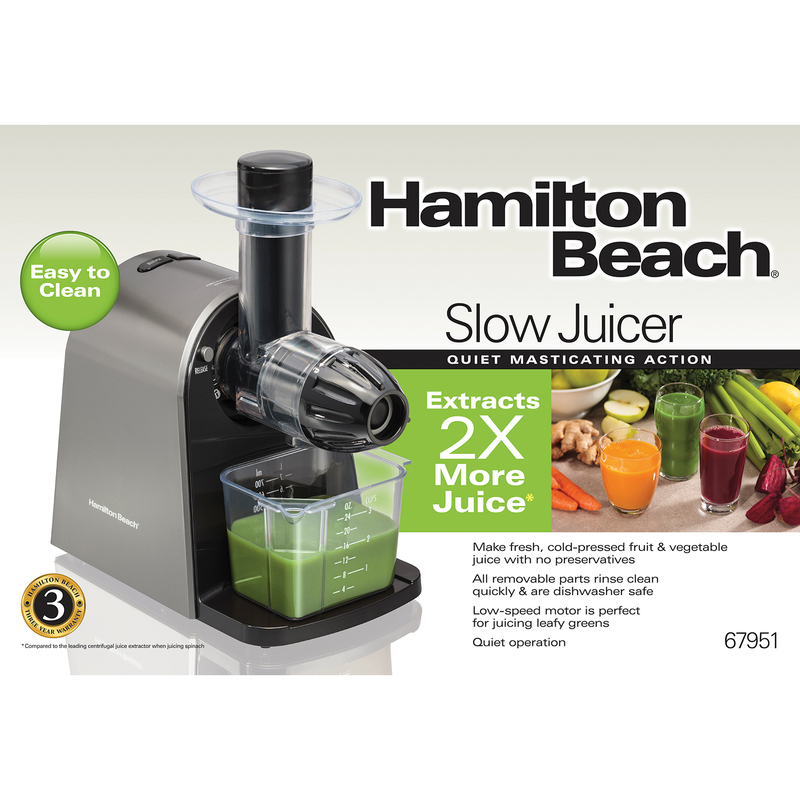 Enjoy the benefits of leafy greens, fresh fruits and nutritious vegetables by making healthy juices at home with the Hamilton Beach® Slow Juicer. This juicer uses masticating action to slowly chew through food. Gradually it crushes and squeezes the food creating pure juice, free of insoluble fiber. Creating pure juice or juice blends is easier than you think. 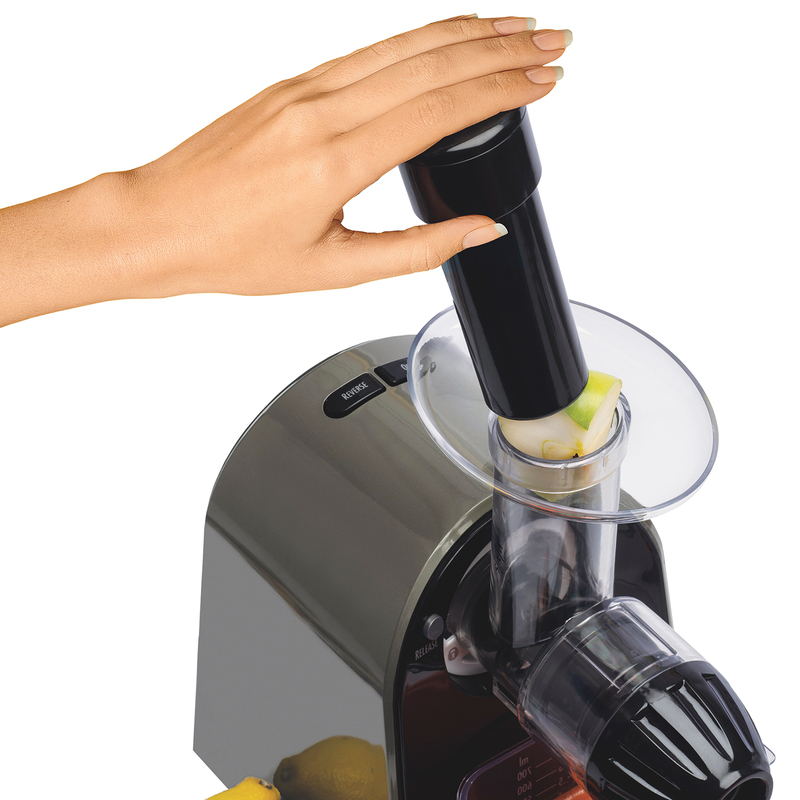 Just press pieces of fruits and vegetables gently down the chute for quick, easy drinks. 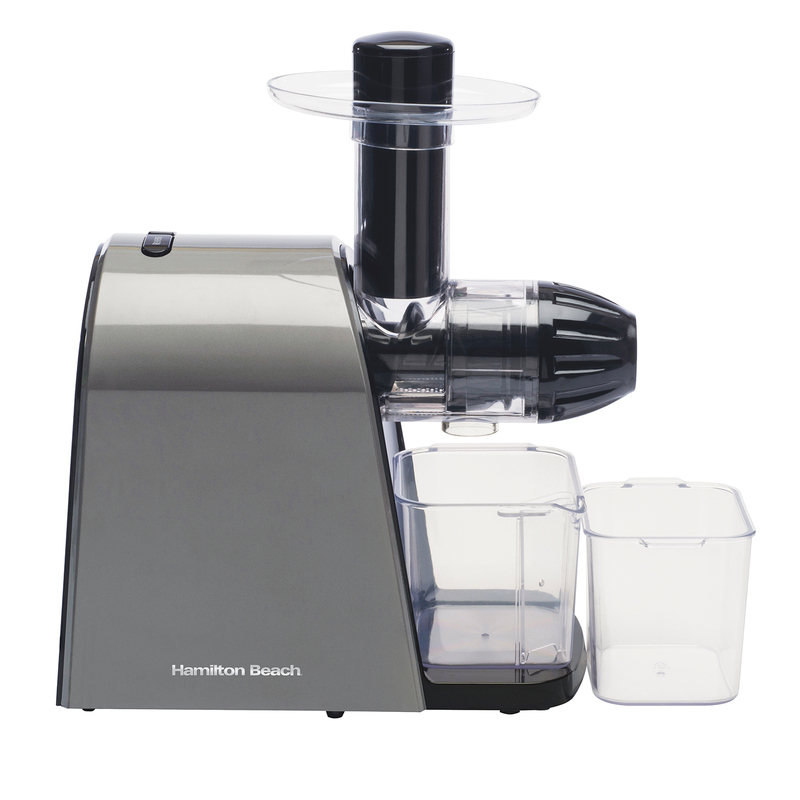 The durable Tritan™ auger quietly crushes and squeezes produce to extract every drop of juice. It drips into a container that separates the foam from the juice when it is poured. Any high-fiber pulp is pushed out to the side and can be used in recipes or for composting. Want to try something different? Use presoaked soy, almonds or rice to create milk for recipes or drinking. 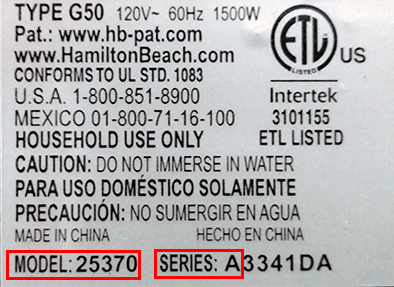 When finished, disassembly is simple and removable parts are dishwasher safe. 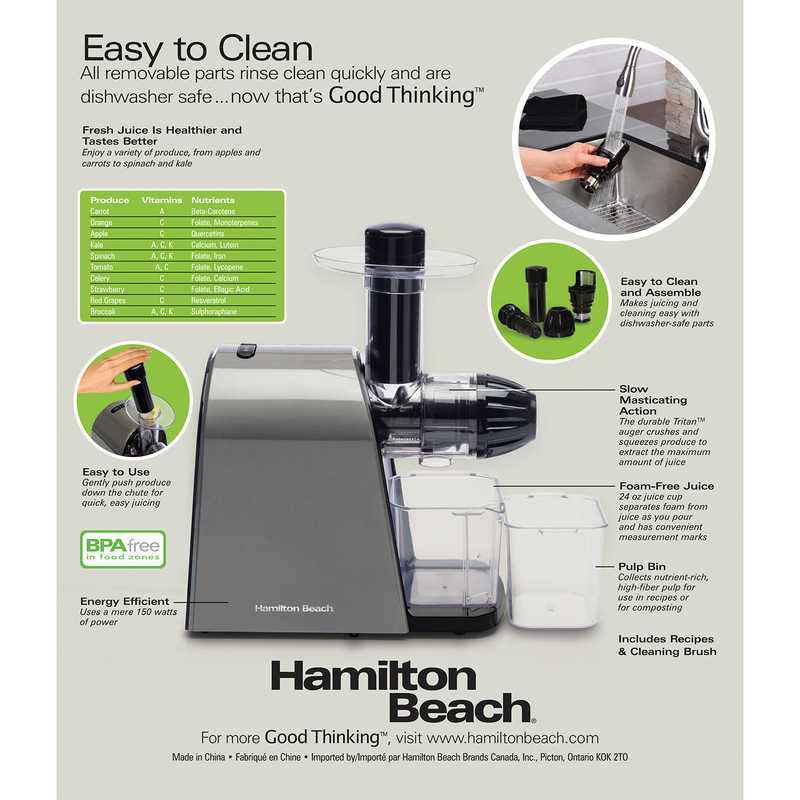 The Hamilton Beach® Slow Juicer comes with recipes, a cleaning brush and a three warranty …now that’s Good Thinking®.